UPDATED: Thu., March 22, 2018, 4:22 p.m. The journeyman plumber who shot and killed a young man attempting to steal his idling SUV nearly five years ago now has a daughter with a felony conviction for car theft. “I get the irony, I get it,” said Gail Gerlach in a phone interview Wednesday. The single shot fired from Gerlach’s semi-automatic pistol on that morning in March 2013 launched a community controversy over the rights of property owners to defend themselves. An unarmed Brendon Kaluza-Graham, 25, was killed by a single bullet fired by Gerlach through the rear window of the stolen Chevy Suburban. 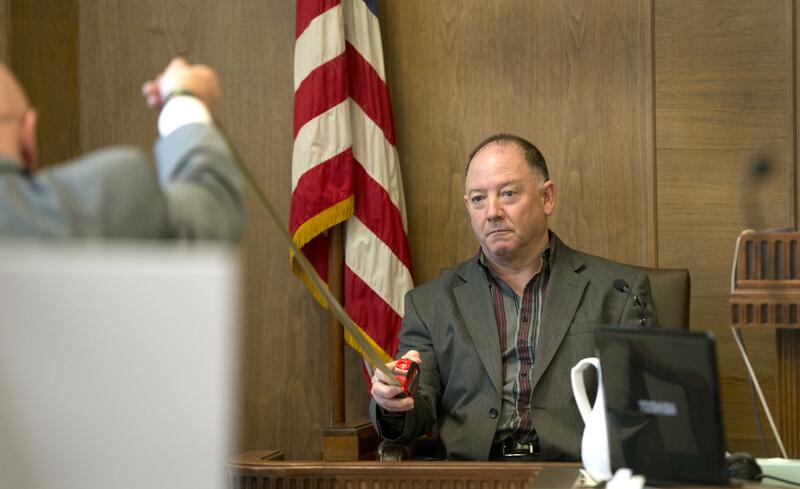 A Spokane jury later acquitted Gerlach of manslaughter, swayed by his claim that he had seen a gun and was acting in self-defense. That same morning, Gerlach knew his daughter had a drug problem. Earlier this month, that daughter – 27-year-old Valerie Gerlach – was sentenced to 13 days in jail after pleading guilty to taking a motor vehicle without permission. Ann Kaluza, the grandmother of Kaluza-Graham, said the sentencing showed the imbalance in the justice system. Valerie Gerlach was riding in a Saturn SUV that had been reported stolen when she was pulled over by Spokane police Officer Ken Applewhaite on Jan. 31, according to court documents. Applewhaite also was one of the officers who spoke with Gail Gerlach the morning of the 2013 shooting and retrieved Gerlach’s pistol from the home’s kitchen. Valerie Gerlach was asleep in the house that morning, her father said Wednesday. She had no prior felonies before her arrest earlier this year, and the man who reported the car stolen told police he had given Valerie Gerlach permission to borrow the car in the past but believed she had stolen the keys from his pocket earlier that month, according to court records. The car theft arrest was the second brush she had with police in several months. In November she was arrested on a bench warrant after a traffic stop by the Washington State Patrol. When officers searched her at the Spokane County Jail they found a pipe that tested positive for methamphetamine and a small bag of brown tar heroin, a cheaper street version of drug, according to court records. Criminal charges were not filed within a mandatory 72-hour period, and Valerie Gerlach was released from custody. Gail Gerlach said the arrests are part of a downward spiral that he feels powerless to fight against. His daughter left jail, stayed at their home long enough for a meal and then returned to the streets, he said. It wasn’t a drug issue that caused Kaluza-Graham to hop into Gerlach’s idling SUV that morning, his grandmother said, though prosecutors told her there were traces of methamphetamine in his system during an autopsy. The 25-year-old, who had been born to teenage parents, had a penchant for joyriding, Kaluza said, evidenced by a criminal history that included several arrests and some jail time for car theft. The memories of coming home to the police chaplains saying her grandson was dead, and the image of what she called “a proud” Gerlach re-enacting the shooting to a panel of jurors at trial, still bring tears to Kaluza’s eyes. She won’t forgive the man who shot and killed the grandson whose childhood pictures still hang in her living room, alongside a pair of his bright blue baby shoes, she said. “Every night, you still feel the sorrow drip on your heart,” said Kaluza, who retired from teaching last year and now cares for her other grandchildren. One of those grandchildren, a 3-year-old girl, was given the middle name Brendon. Gerlach, who in a brief statement after a jury acquitted him said that he regretted Kaluza-Grahama didn’t have “a chance to turn his life around,” repeated those comments Wednesday. Gerlach said he doesn’t know where his daughter is staying now. Valerie Gerlach’s two children are staying with their father, and Gail Gerlach is continuing his life as a semi-retired maintenance technician, still living in the same house that was the scene of frenzied police activity that chilly morning nearly five years ago. “If your story could get one family to find some way, or one politician to make one bill that would help, I’m all for it, because the problem is that drug, and what do you do?” he said. Published: March 22, 2018, 6 a.m. Updated: March 22, 2018, 4:22 p.m.